Today marked the real first day of hockey in Albany, as the Devils kicked off their second training camp. The 14 players reassigned from New Jersey on Saturday, plus 2 additional players (D Mike Banwell, who played 4 games at the end of the season with Albany, and F Bryan Haczyk, here on an AHL contract). The Devils website has a wrap up here, including a Flickr gallery and an interview with coach Kowalsky. Also out today, this year’s promotional schedule. And it’s pretty good. Giveaways, autograph sessions, public skates, and some concession specials fill the calendar. The fun starts on Opening Night October 8th, with a magnetic schedule to the first 5,000. There are 5 post game autograph sessions, all but one on Sunday afternoons (meaning I need to find 5 things to get autographed): October 16th, November 13th (my designated birthday game), December 4th, January 16th, and March 18th; 3 bobbleheads TBA (hopefully this time around no one gets traded before it comes out to the public) on January 28th (NJ player), February 18th and March 18th; a team poster on December 30th (and $10 tickets for all to boot); Pucks-n-Paws on March 31st, a school day game on March 28th (with a special 11:30 AM start time), GE Kids in Free on January 14th (with a free T-shirt), and at the end of the season, a Fan Appreciation Night (April 7th) and a Military Appreciation Night (April 14th). First game is tomorrow night in Connecticut. I will not be around to check on it due to work obligations…but looking forward to starting up again on Saturday night in Glens Falls. Just as I had guessed the other day, today the Devils made their first round of training camp cuts, sending 5 players back to their junior teams and sending 14 players to Albany. All but 3 of the first round cuts played at least one game for Albany last season. Gelinas is a 2009 2nd round pick who spent last season with Saint John in the QMJHL. Burlon is a 2008 2nd rounder from the University of Michigan. Whitney was signed as a free agent after completing a four year career at Boston College. Before the Rangers beat the Devils 4-3 at the Rock last night in the second preseason game, the first AHL scrimmage between the two teams played out yesterday afternoon in Newark. The Rangers pulled it out 5-4 in overtime thanks to a game winner just 16 seconds into the extra frame. 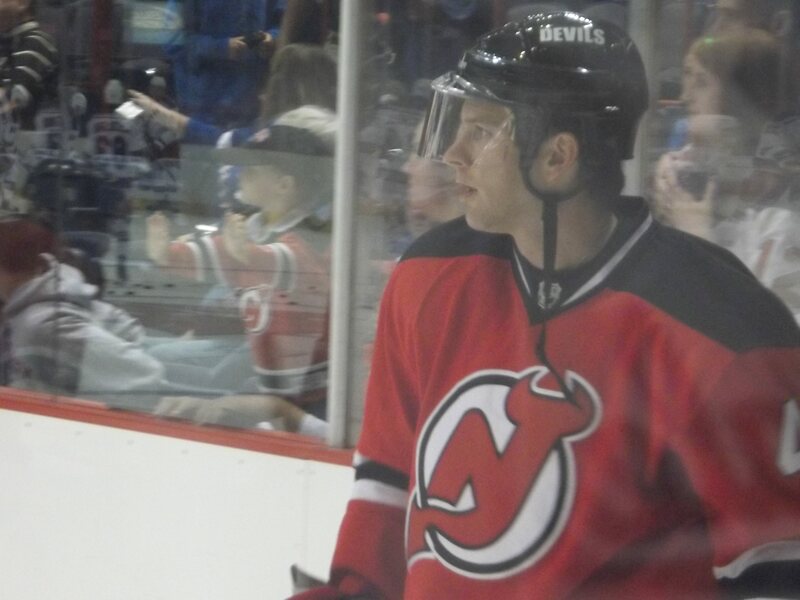 Darcy Zajac tied the game at 4 with 25 seconds left in regulation. J.T. Barnett, J.S. Berube and Nathan Perkovich also scored. Maxime Clermont and Scott Wedgewood split time in goal, with Clermont taking the loss. The parent Devils play the Islanders in Long Island tonight in their third preseason tuneup, with Johan Hedberg expected to play the full game. After tonight, New Jersey does not play again till Thursday against the Flyers, while Albany plays their first preseason tuneup on Tuesday night in Connecticut against the Whale. Since there’s only one goalie on the list, I would expect a second one to come down by Tuesday unless there’s another one coming to the Albany camp. Hard to believe we’re only 2 weeks away from Opening Night…things are about to start picking up! If last night’s preseason victory by New Jersey over the Rangers at the TU Center is any indication, there’s a good reason to be optimistic this season. The main storylines involve some old River Rats history and a new NHL preseason attendance record…9,420 were on hand to watch a thrilling 2-1 overtime win for the Devils in their first preseason tuneup. Rookie goaltender Keith Kinkaid made his professional debut against–of all goalies–Henrik Lundqvist. And he did not disappoint, stopping all 10 shots he faced in just over a period and a half of work. 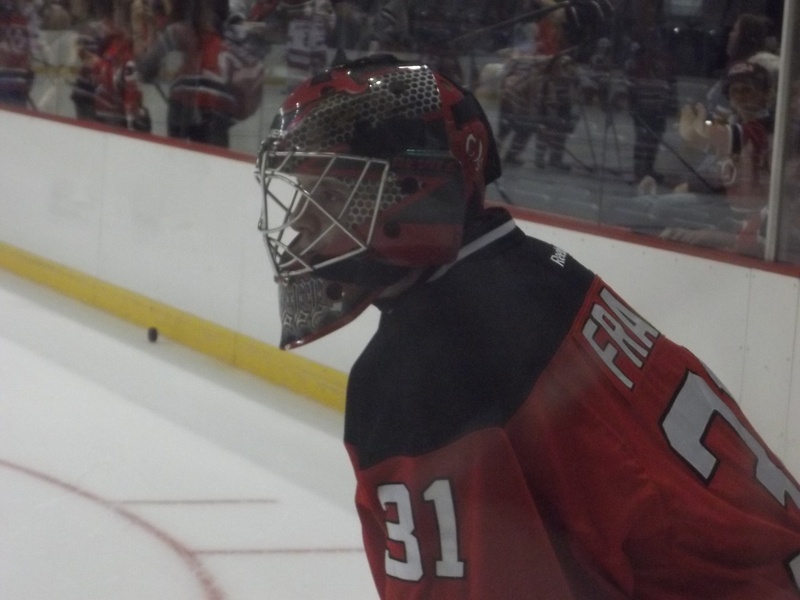 He barely broke a sweat early on, as the Devils outshot the Rangers 6-1 early in the first period. Petr Sykora, a former River Rat here on a tryout, was the first to score, getting one past Lundqvist with 8 and a half left in the first. First round pick Adam Larsson, also making his pro debut, notched an assist on the goal. Nothing across during the second period, as Jeff Frazee and rookie Cam Talbot took over the goaltenders duel. But the first fight of the preseason did break out by the Devils bench, a spirited bout between former Rat David Clarkson and the Rangers’ Andre Deveaux, who earned an early exit for his efforts. Third period the Rangers finally started waking up. 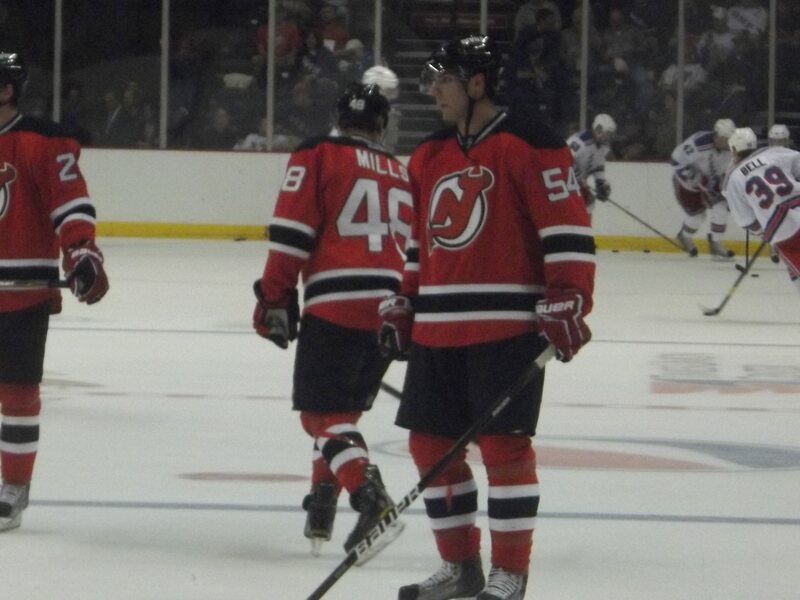 First came Round 2, a center ice bout between the Devils’ Brad Mills (an Albany regular) and the Rangers’ Dale Weise. I gave Mills the win on this one, only because he didn’t need a new sweater. But it was Weise with the last laugh, scoring the tying goal on Frazee with just over 4 minutes left in regulation. The game went into overtime, and it didn’t take very long to find a winner. Another former Rat, Patrik Elias, scored the game winner just 45 seconds into the extra frame as New Jersey held on for a 2-1 victory. 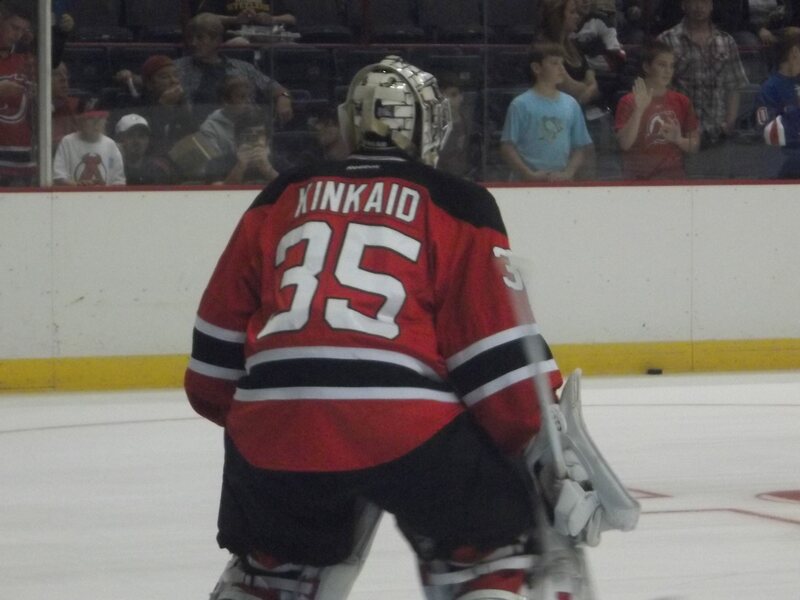 Kinkaid is as advertised. He looked more like a seasoned veteran than a kid just off of his second year of college. I had wondered why the Devils had gambled signing him (with so many goalies in the system and Brodeur’s status), but it looks like the gamble could pay off if he repeats last night’s performance. I didn’t pay as much attention as I should have to most of the other Devils out there…probably because thanks to a friend of mine I got a seat upgrade from upstairs to one row behind the bench. Sadly it was the Rangers bench. 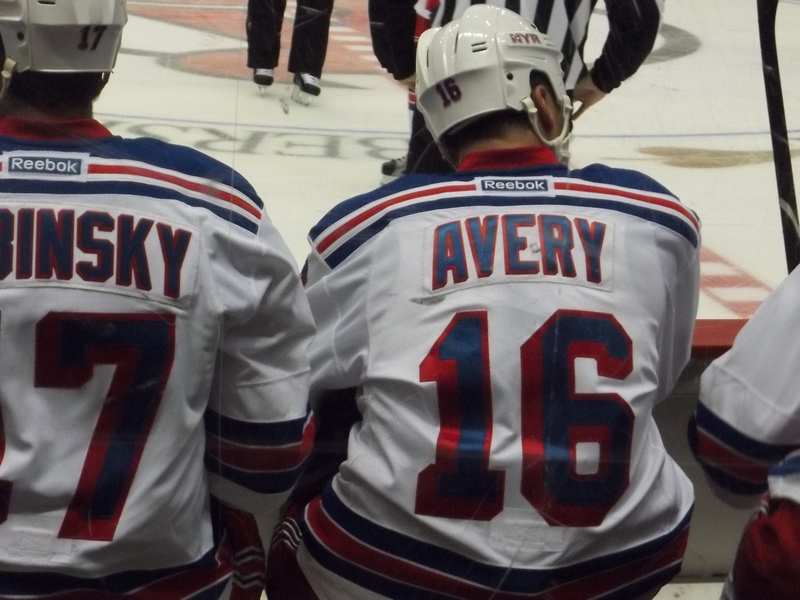 Try staring at the back of Sean Avery all evening while trying to watch/scout a game. I wasn’t exactly planning a pregame blog post, since it is a preseason game, but there’s lots of info to process before the Devils and Rangers hit the ice at the Times Union Center tonight. -First, here are the Devil and Ranger rosters for tonight’s game, via Fire and Ice and the Times Union blogs. -A preview of tonight’s matchup courtesy of In Lou We Trust. -Per Devils coach Peter DeBoer, rookie Keith Kinkaid is scheduled to start and play all 60 minutes tonight. First opponent? None other than Henrik Lundqvist. Good luck, kid. I am very looking forward to finally seeing what he can do against pro competition, since we will be seeing a lot of him here this season. -The game will be televised on MSG, with I believe the Ranger broadcast team and Chico Resch. -I’ll have a little bit on the Twitter side (not full on updates, those start next Saturday in Glens Falls), but you can also follow @fireandicegame, they will have full coverage. -Game time: 7 PM. The Rangers are considered the home team, however the Devils will occupy the normal “home” bench but wear their road uniforms. New Jersey is playing 6 preseason games, starting with the Rangers here on September 21st. They host the Rangers at the Rock on September 23rd, followed by a road game on the 24th against the Islanders. They close the preseason out with a 3-in-3: September 29th in Philadelphia against the Flyers, and September 30th and October 1st at the Rock against the Islanders and Flyers, respectively. With Albany’s preseason slated to begin on the 27th, I would think by next weekend we’ll have a better idea of who will be skating in Albany this season. -Earlier today, a third Devil exhibition game was announced. The team will travel to Olympia Ice Center in West Springfield, MA to take on Portland on Friday, September 30th at 7:30 PM. All three of their preseason games during the last week of September are road games. I guess you could count the New Jersey-NY Rangers as a home preseason game, but not really: despite the Devils affiliation here, they will actually be the visiting team. -One name that just missed the September player tracker is 3rd goalie David Caruso, who I’ll put in the Moving On category. He has signed with the ECHL’s Trenton Titans, who take over where the T-Devils left off. -Also earlier today, the Devils announced 5 non roster invitees to training camp: former Devil/River Rat Petr Sykora (now there’s a blast from the past), defenseman Anton Stralman (over from Columbus), winger Steve Bernier (over from Florida), and two rookies from developmental camp, Justin Barnett and Thomas Nesbitt. I expect the full list to be out before the end of the week, since rookies report on Friday, veterans on Saturday. -Countdowns: 9 days to NHL preseason in Albany (which I finally bought my ticket for today), 15 days to Albany’s preseason, 26 days to Opening Night. It’s almost here! Yesterday afternoon the AHL finally announced the venue for the 2012 All Star Game on January 30th…a very interesting choice indeed. The game will take place at Boardwalk Hall in Atlantic City, NJ, the 4 game neutral home the Devils used last season. It is the first time the league has held the game outside an AHL city. I already know a few people that are planning to attend, the jury’s still out for me on that one…a few days after the game is my planned trip to Wilkes-Barre (and possibly Connecticut the day before), I love travel but can only take so many miles on the road. -Lokomotiv’s scheduled opponent, Dynamo Minsk, still had an event on the ice last night…but instead of a game, a touching tribute. -Dallas blogger Jeff Chick and the difficult task of driving Karlis Skrastins’ family to the airport. -A piece on the former NHL stars that would have suited up for Lokomotiv this season. 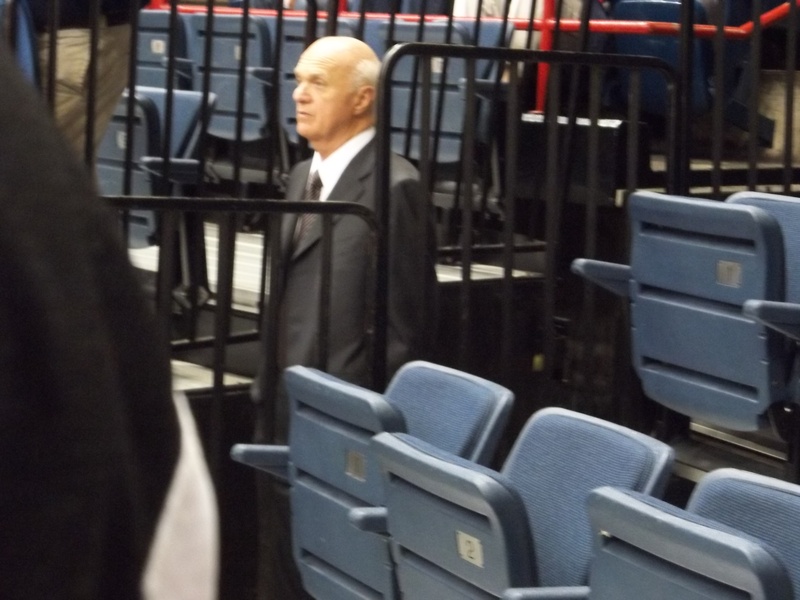 -One item I did not link the other day: a statement from Lou Lamoriello on the tragedy. The Devils held a vigil for Alex Vasyunov and former Devil Karel Rachunek earlier today at Championship Plaza, just across the street from the Prudential Center. On a much lighter note…12 days to go till hockey returns to the Capital District. Hopefully the ice should be in place soon!